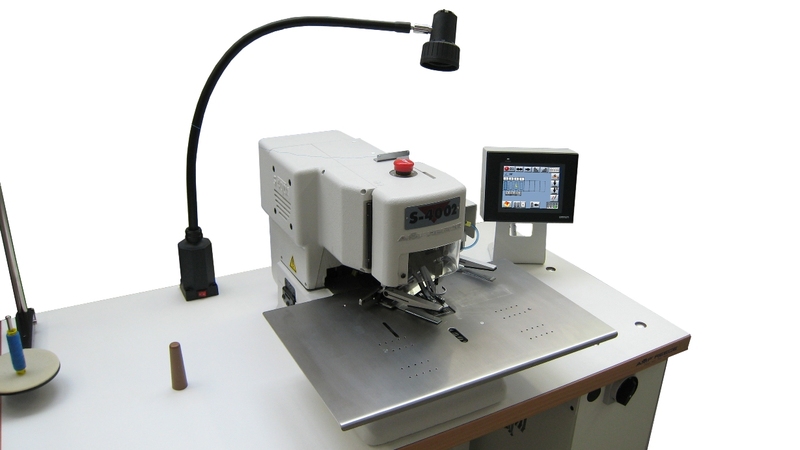 The S-4002 ISBH is a fully electronically controlled chainstitch straight buttonhole machine designed for sewing decorative non-functional buttonholes on jacket sleeves. The machine is based on the well known AMF Reece S-4000 concept. Utilizing powerful three-phase stepper-motors ensures exact placement of individual stitches and brings more freedom in buttonhole design for user. Electronic feeding further eliminates several mechanisms including clutches and gears thus reducing necessary maintenance and extending machine life-time. Electronic Stop and Start Motion extends machine life and improves machine reliability by eliminating the stop motion and clutch mechanisms. High Sewing Speed combined with low noise level is adjus-table from 1,500 spm to 3,800 spm. DC Drive Motor fully enclosed within the head casting eliminates the need for an under the table mounted cluth motor, pulley, belt and brake. This reduces required mainte-nance and eliminates oil and dust around the working area. Pneumatic System is used for the thread trimming and clamping that reacts to different material thicknesses and types of fabric. Together with the Single Pedal Electronic Start it increases production and reduces operator's fatigue. Semi-Automatic Lubrication System and Oil Monitor provide additional safeguards that increase machine life and dependability. The Appearance of ImitationSleeve Buttonhole is different to a normal buttonhole which is squared at both ends. The ISBH non-cut buttonhole has one squared end and the other „show" end has less stitches which gives a rounded effect. This is achieved by the use of a special cam. On the finished garment the button is sewn over the squared end.